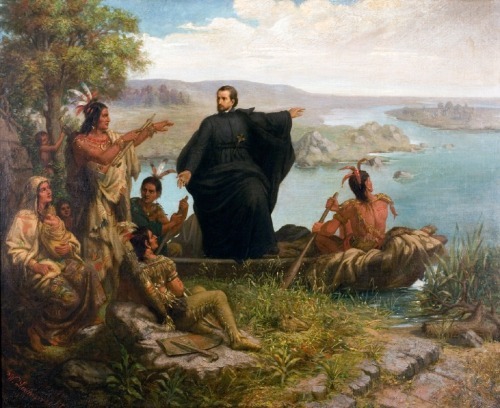 Using art, historical maps, broadsheets, books, liturgical objects, and textiles, Crossings and Dwellings tells the story of 19th-century European Jesuits and women religious who arrived on the country’s expanding western frontier to serve both indigenous and immigrant populations. This exhibition includes liturgical and educational treasures, such as globes by Willem Jansz Blaeu (Dutch, 1571–1638), drawings by Nicolas Point, S.J. (French, 1799–1868), maps by Pierre Jean De Smet, S.J. (Belgian, 1801–1873), the chalice of Sébastien-Louis Meurin, S.J. (French, 1707–1777), a cope made by St. Rose Philippine Duchesne, RSCJ (French, 1769–1852), and vestments created by indigenous people and presented to De Smet. The exhibition will also examine the pioneering role of the Religious of the Sacred Heart (RSCJ) and the Sisters of Charity of the Blessed Virgin Mary (BVM) in building Chicago educational institutions, including several schools in Holy Family Parish, Immaculata High School, and Mundelein College.